Joe Stilgoe is one of those performers that makes the audience feel completely relaxed the moment he steps onto the stage. It is a rare talent: his mix of stand-up humour and virtuoso musicianship make for an enthralling evening. Add to the mix his abundant charisma, decorate the icing with a top-notch selection of guest artists and sprinkle with a finale of fake snow and you have the perfect recipe. Stilgoe’s show; “Christmas at the Movies” represents that pivotal moment in the year when you know that the festive season has truly started. Featuring some of the best-known Christmas music from films, Joe’s eclectic selection is the perfect way to celebrate Christmas. Stilgoe opens proceedings by announcing he is his own warm-up for the night. As the gig is being recorded for a special Radio 2 broadcast on Christmas Day, he feels he wants to get the crowd in the mood first. “Don’t ‘ooh’ and clap at the same time otherwise they won’t be able to use it” he instructs, before he elicits three different varieties of applause from us to ‘edit in later’ if necessary. This self-deprecating style is his motif which adds to his charm. A charm that hasn’t diminished in the slightest despite the spiralling success of his career over the last few years. 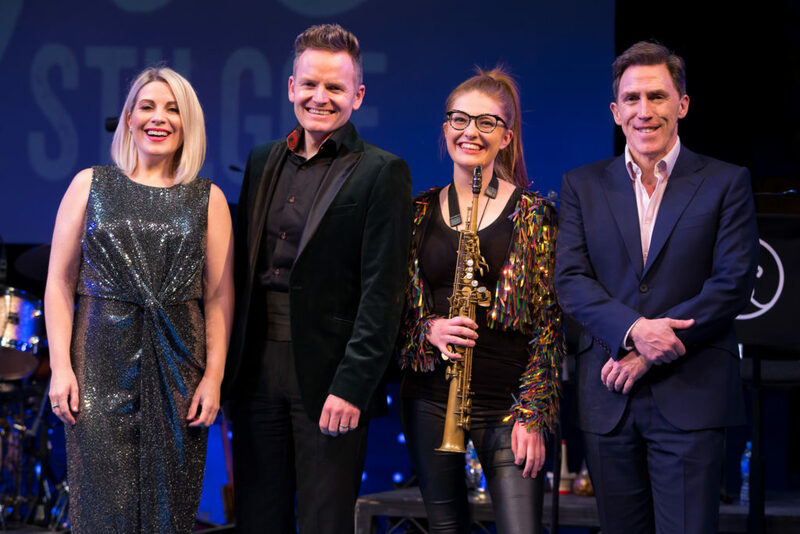 Backed by his six-piece band he launches into a medley of Irving Berlin’s “Top Hat, White Tie and Tails” and “Puttin’ on the Ritz” before bringing on his first guest; West End star Louise Dearman. A trio of festive favourites that highlight Dearman’s peerless voice is capped by Frank Loesser’s “Baby, It’s Cold Outside”. Jess Gillam, the second guest, is totally transfixing on saxophone, performing Itturalde’s “Pequeña Czarda”. A ridiculously difficult piece she cloaks the sheer technical wizardry in passion and an emotional warmth that leaves us quite breathless. Stilgoe’s piano accompaniment is quite something, clearly revealing the breadth of his own skills. The first act closes with ‘Have Yourself a Merry Little Christmas’ from “Meet Me in St Louis” (again with Gillam on saxophone) followed by Stilgoe’s self-penned “Mr Panettone”. My only gripe is that Joe did hint that there might be some complimentary panettone waiting for us in the bar at interval. There wasn’t. Yet nobody cared, as we were all itching to get back into the auditorium for Act Two. He opens the second half asking for trouble. Inviting requests from the audience, he rather foolishly promises to deliver. Among the titles thrown back at him are “Fairy-tale of New York”, Wham’s “Last Christmas”, “Nessun Dorma” and Handel’s “Messiah”. Yet he effortlessly merges the suggestions into a faultless impromptu medley. A skill replicated later during a set with his next star guest: Rob Brydon. Between the two of them they ask members of the crowd for their worst ever Christmas present, which produces a delightfully absurd ad-lib Blues duet. Brydon then sings “I’ll Be Home for Christmas” morphing from Bing Crosby to Michael Caine and back again. After a couple more of Joe’s own compositions the show concludes with “White Christmas” and “Let it Snow”. Flecked with hilarious tongue-in-cheek moments this is a show of serious musicianship. Joe Stilgoe is a natural entertainer; a real music-man: talented, funny, engaging and blessed with a wonderful gift. Make it your gift for Christmas by tuning into the broadcast on Radio 2 on Christmas Day.